On the fifth day we hear from Genesis 6-9. We have heard how the first man chose to turn from God, and broke communion with Him. Now we hear how his descendants followed the same path, descending ever deeper into darkness and further from the love of God. This is a challenging story to read to children. It is hard to imagine the reality of this event; God wiping most of His creation off the face of the earth. Yet, we must also recall that God offered such incredible grace and opportunity for repentance. Noah prepared for over one hundred years. Over one hundred years for people to repent, to turn from sin, to turn back to God. Only Noah chose to walk with Him. And so God made His covenant with Noah, and set the rainbow in the sky as a sign. 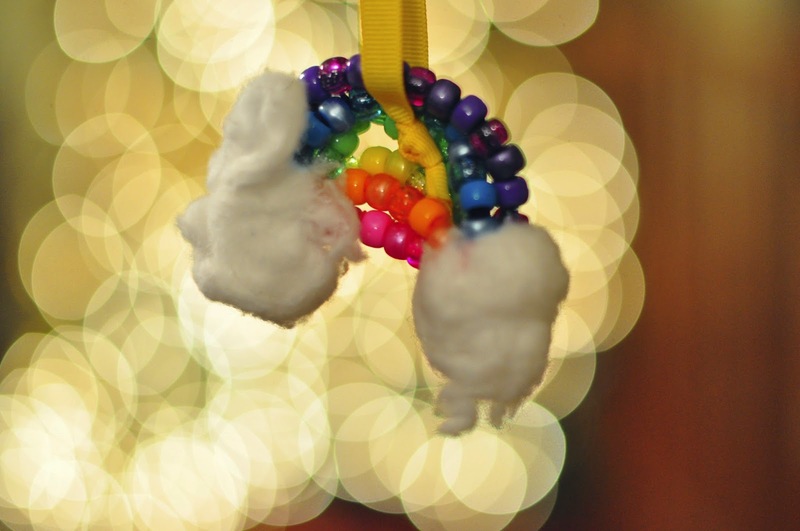 Our ornament for today is a rainbow created from pony beads and cotton balls, and we love how it glows in the evening light! Our Nativity book reading continues from the previous evening, with A Perfect Christmas. One of these days I'll put together a Jesse Tree! I am loving your posts.